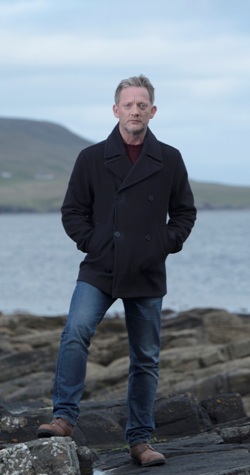 Shetland, the BAFTA Scotland award winner for Best Television Drama in 2016, is one of the best mystery-crime drama series on telly today, and I was over-the-moon excited about interviewing the lead actor, Douglas ‘Dougie’ Henshall (In Plain Sight, Collision, Primeval), who plays Detective Inspector Jimmy Perez of the Shetland Police. In chatting with him about the series and his character, what Henshall revealed speaks to the kind of actor he is and, while unintentional, offers a bit of insight and notes for aspiring actors. They’re worth taking to heart, since he won the 2016 BAFTA Scotland Best Actor-Television award for his portrayal of Perez. But Henshall is more than an award-winning actor on telly, film, and the stage. He is also a first-time dad. His smile was obvious in his voice when he spoke of his 19-month-old daughter, but for as much as he adores his wee bairn, he doesn’t bring her with him to work, at least not anymore. Henshall’s character, DI Jimmy Perez, was introduced to viewers in the two-part pilot (aka Season 1), which was adapted from the novel Red Bones. How did he prepare for the role? What did he do to translate Ann Cleeves’ words into his embodiment of the character? “I read [Red Bones] just to get a feel for him, and to get a feel for the place and how Ann wrote, trying to do her a little bit of justice. So I read that, but then I didn’t continue. Once I’d gotten little bits of what I felt was useful for me from the first book, then I kind of let them go after that. I didn’t want to rely too much on it. “I picked up little things from the book, but there were things that I got from the script, which is basically your working material, and what I got was that he was kind, essentially, and empathetic, and a little lonely. “I felt that I wanted to make it mine. I picked up those little things that I felt were interesting to play with and then just saw where it kind of took me, really, and how I felt about the environment I was in and all those different little things that go into making a character a lot less specific and a little bit more ethereal, if you like. 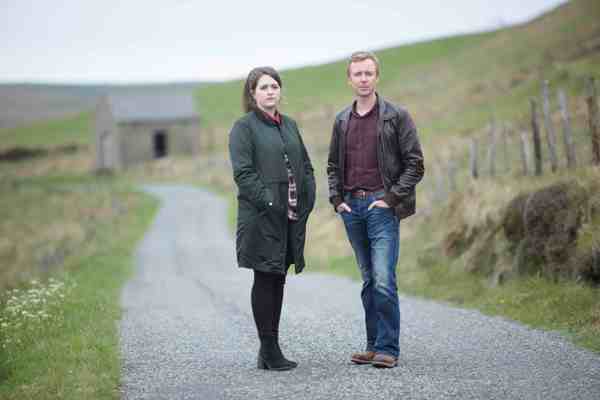 Viewers love Shetland, so all the little bits have been worth it for us, too. Those who have been watching the series since its launch may have noticed Jimmy Perez’s subtle growth over the first four seasons. I mentioned this to Dougie and asked him his thoughts about it. “Well, [lead writer] David Kane, and to a lesser extent Gaby Chiappe — I tend to be influenced by what they write. If I think it fits okay, then I try to explore what they’re trying to do. Maybe I’m an old-fashioned actor, but I always think that your job first and foremost is to sell what’s written rather than yourself, so I tend to go with that if it doesn’t feel funky. “I think [Jimmy is] becoming a bit more disillusioned and a little bit more defensive, and I think maybe that came out a little bit [in Season 4]. And also, how do you deal with somebody who wasn’t being really helpful and didn’t feel the need to be helpful or be likable or any of those things, and having to kind of trust your instincts about the greater good. And that’s typical [in the series]. Viewers know Perez was deeply affected in Season 3 by an off-camera event that happened to Detective Sergeant Alison ‘Tosh’ McIntosh, played by Alison O’Donnell. In this and the other three seasons, part of Perez’s growth has been inextricably linked to his relationship with Tosh. Given where these two characters started and where they are at the end of Season 4, I asked Dougie about how Jimmy relates to Tosh and sees their relationship. So with Jimmy and Tosh being a part of each other, what part of Dougie is within Jimmy Perez and what part of Jimmy Perez is within Dougie? Then it’s no wonder that viewers adore Jimmy and that Dougie has legions of fans because, with my frame of reference being our phone conversation, I can attest to the actor being gracious, generous, and, well, kind. Along similar lines, curious minds want to know: Does Jimmy Perez have a sense of humor? With Shetland having rather dark storylines, we don’t get to see him smile very often, much less laugh. And we’re really looking forward to seeing it! Well, then, fingers crossed that the BBC commissions Season 6 of Shetland and the writers craft a story that features both Jimmy and James Perez. Until then, here’s a look at the new season of Shetland (commissioned as Season 4), which debuts Monday, July 9th, at 9 PM PT, on KCET — still the largest independent public TV station in the country. 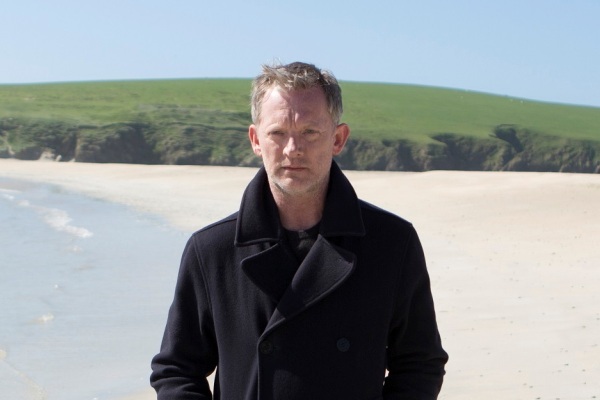 Shetland is the centerpiece of KCET‘s new Monday night British TV lineup, which includes Death in Paradise at 8 PM, Cold Feet at 10 PM, The Wrong Mans at 11 PM, and Mum at 11:30 PM. In the new season’s first episode, Shetlander Thomas Malone (Stephen Walters, Outlander) is released from prison after 23 years, following the overturning of his murder conviction based on DNA evidence. This prompts DI Jimmy Perez and his team to re-open the case, but their inquiries get complicated when they have a new murder to investigate, as well — that of a young journalist who was the daughter of Drew McColl (Sean McGinley, Republic of Doyle), the now-retired detective who led the investigation that got Malone convicted. The narrative gets darker and more intricate from there, and viewers in Southern California should definitely tune in to KCET on July 9th, 16th, 23rd, and 30th, and August 6th and 13th, to see the entirety of the story, because it is brilliant. My thanks to Dougie Henshall for our chat and to KCET for arranging the interview.